Four finalists and their mentor (one per finalist) or teammate (in place of a mentor/advisor) will be awarded a four night trip (airfare, transportation, hotel, food and entry fees) to NASA's Kennedy Space Center (KSC) in Orlando, Florida in late July or early August. 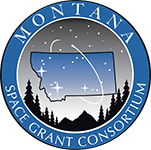 Here you will have three days to explore the remarkable KSC with two Montana Space Grant affiliates. See the the launch control consoles of the Apollo program in the firing room along with the largest rocket ever made, the Saturn V (check out this launch breakdown video of the first 30 seconds of Apollo 11 launching). Touch a Moon rock and see the Apollo 14 command module and space suit that traveled to the Moon. Check out Space Shuttle Atlantis which is now on display up close and personal along with much, much more. If you are a space nut, this is a remarkable place to explore. Learn more about what the Kennedy Space Center has to offer by clicking here! Trip details will be added in the future as arrangements are made or feel free to contact us if you have any questions. Above: The F1 engines of the first stage the Saturn V rocket on display at the Apollo/Saturn V Center of KSC. The first stage of a Saturn V rocket weighed a measly 303,000 lb dry and a staggering 4,881,000 lb when loaded. These five bipropellant engines provided a total thrust of 7,500,000 lb, or around that of 40 Boeing 747s! Above: Space shuttle replica "Explorer" (now at the Johnson Space Center in Houston, TX) on display at KSC. The Space Shuttle Atlantis (the shuttle used during STS-135, the last shuttle mission) is now on display at KSC for visitors to see up close!